India’s most beloved dessert and a favorite at Indian buffets! Here’s an easy and fail-proof recipe to make these melt-in-the-mouth Gulab Jamun at home. 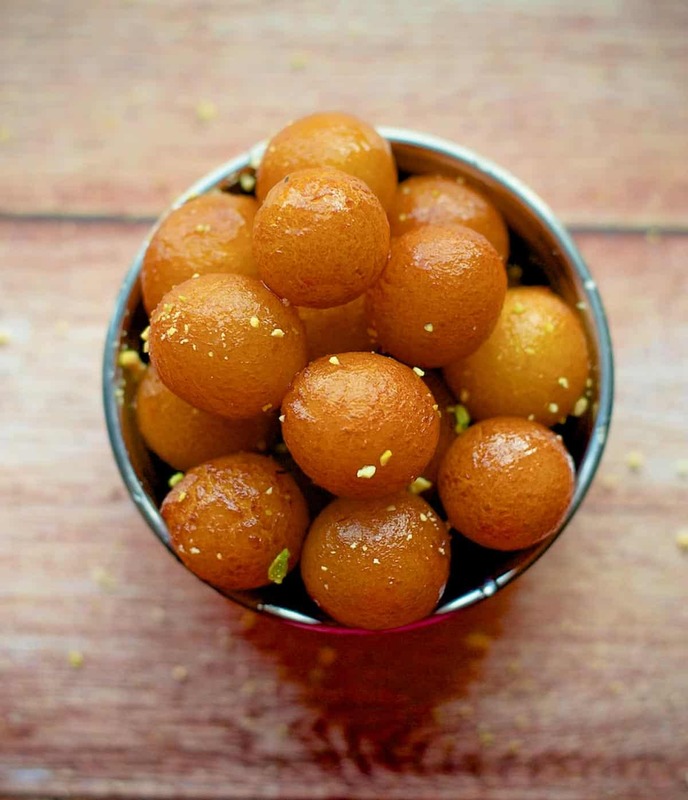 Indian buffets worldwide would be incomplete without Gulab Jamun – a dessert made traditionally made from Khoya. Khoya is prepared by heating milk over a low flame till most of the water content is evaporated. Fortunately for us, there is an easier way of making Gulab Jamun using milk powder and my recipe does exactly that. Make sure you read the tips below before you embark on your journey to make India’s most loved and popular sweet – Gulab Jamun!. For those who care about a little history – The word “gulab” means Rose, referring to the rose water-scented syrup and “Jamun” or “jaman” is the Hindi word for an Indian fruit with a similar size and shape and this dessert is said to have Persian origins. Dough softness – To get soft Gulab Jamuns, the dough needs to be really soft. Using a little ghee or clarified butter (as needed) during the kneading process, helps achieve that. Also, when you make the balls make sure there are no cracks or else they will disintegrate when you add them to the sugar syrup. Oil temperature – The oil needs to be kept at medium-low. If the oil is too hot, then the outer layer will cook faster leaving behind an uncooked center. 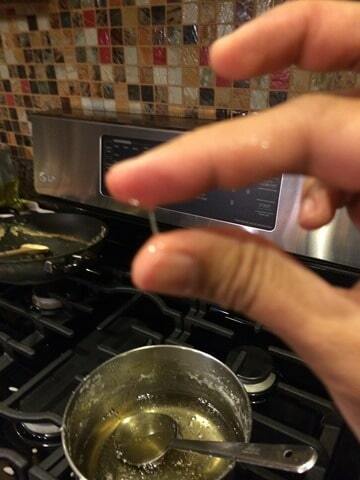 When you drop the balls in the oil, it should slowly rise to the surface. If it rises quickly, that means the oil is too hot and if it doesn’t rise at all and stays at the bottom, you need to increase the heat. I waited for so many years before I tried making them at home. There is no reason you should. Try them NOW and you will never ever buy one from a store ever again! India's most beloved dessert and a favorite at Indian buffets! Here's an easy and fail-proof recipe to make these melt-in-the-mouth Gulab Jamun at home. On a gas stove, place a deep medium sized saucepan on medium heat, add sugar, water, rose essence (if using) and cardamom powder (if using) and bring this mixture to a boil. Reduce heat to medium-low and continue to cook until one string consistency is achieved (please see tips above). Reduce heat to a simmer. Heat oil in a deep dish pan on medium heat. (Note: This oil will be used for deep frying the Gulab Jamuns so make sure you are using enough oil to completely immerse the Gulab Jamuns). Reduce the heat to medium-low and add one gulab jamun to the oil and if it slowly rises to the surface, then your oil is ready. If the Gulab jamun rises too fast, then your oil is too hot, so reduce the heat before you proceed(see tips again..). Once you think you have achieved the right temperature of the oil, add 5-6 Gulab jamuns to the oil. Continuously stir them using a slotted spoon till they achieve a consistent golden brown color (Note: they will darken further once drained). Drain them on a paper towel. Bring the sugar syrup to boil again and then take it off heat and set it aside. Add the drained Gulab Jamuns to the syrup. Cover and let the Gulab Jamuns absorb the syrup for 1.5 - 2 hours till they have doubled in size and have soaked up the sugar syrup. 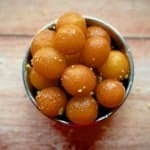 If you loved this easy Gulab Jamun recipe, I am sure you will love my other sweet recipes as well. Check them out!